Google’s Jeff Dean did an excellent talk at Stanford as part of EE380 – it is worth one’s time to listen. Very informative, instructive and innovative. As I listened, I jotted a few quick notes. Interesting to hear that in 1999 they used to update a web page store in a month or two, but now it is reduced 50000X to seconds! Trivia : They have had long distance links failure by wild dogs, sharks, dead horses and (in Oregon) drunken hunters ! Data has doubled while the number of machines have been constant from ‘07 to ‘10. Trivia : Jeff shared an anecdote where the network engineers were rewiring the network while Jeff & Co were running MapReduce. They did lose machines in a strange pattern and were wondering what is going on; but the job succeeded, a little slower than normal and of course, the machines came back up ! Only after the fact did they hear about the network rewiring ! He is working on a project called Spanner, that spans data centers. Looks like this is one of their hairy problems. Dean also mentioned this during Q & A. All their systems work well inside a datacenter, but have no way of spanning datacenters. They have manual methods & task specific tools to copy data across datacenters, monitor tasks across datacenters and so forth. But no systemic infrastructure. I am compelled to insert Jeff’s “Numbers Everyone Should Know” as it is a very useful chart. I hope Jeff doesn’t mind. [Update 11/17/10] Thanks to Kevin Le, this chart comes from Norvig’s blog. Identify common problems & build general systems to address them. Very important not to be all things to all people. Paraphrasing Jeff, “That final feature will drive you over the edge of complexity“! He also likes multiple small units per machine than a mongo job running on a big machine. Smaller units of work are easier to recover, load balance and scale. << agreed! He concludes the talk saying there are lots of interesting “Big Data” available. 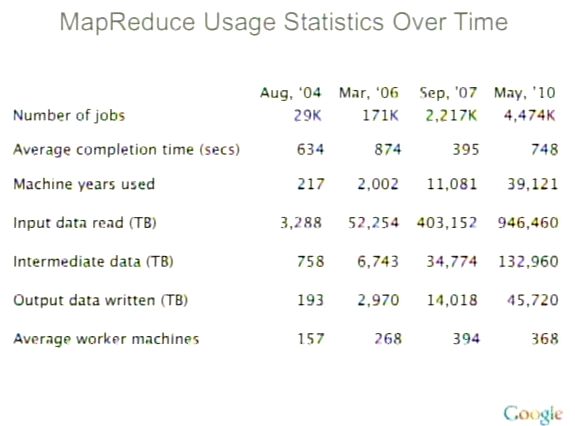 [Update 11/12/10] Last year Jeff has given a similar talk on scalability at WSDM 2009. Video [here] and slides [here]. Notes [here] and [here]. 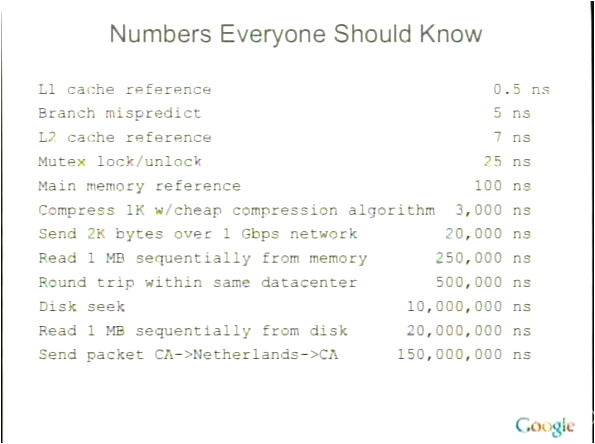 I think that ‘Numbers Everyone Should Know’ chart might’ve originally come from Peter Norvig’s ‘Teach Yourself Programming in Ten Years’ http://norvig.com/21-days.html, written 5 years ago. The chart is also much more legible there, and it comes with a very interesting essay on developing a career as a programmer.